You know how parents tell their kids “I love you, but I don’t like you right now.” That’s how I feel about cooking sometimes. Cooking! I love you, but right now I can’t with you. Most of our meals are either things I can make ahead of time or recipes that take 30 minutes or less. But you know what? I think it’s more challenging to develop a recipe that can be on the table in a short amount of time or that requires a minimal amount of ingredients than a recipe with eleventy-billion steps and ingredients, so I’m always appreciative of cookbooks where I can find recipes that are practical for my family. These tostadas from Minimalist Baker’s Everyday Cooking are doubly awesome in my book because 1) the tofu can be made in advance for a 5-minute weeknight meal, and 2) even if you don’t make the tofu in advance, the recipe is still a 30-minute meal. And it’s versatile—the tofu, inspired by Chipotle’s sofritas, can be used as a taco or burrito filling, nacho topping, bowl component, or whatever else you can dream up. Yes! I adore this cookbook because it has 101 vegan recipes and all of them are 10 ingredients or less, require 1 bowl or pot, or are only 30 minutes to prepare. So basically, thumbing through this book, I want to weep tears of joy because it’s full of recipes made for people like me. People with babies who go to bed at 6pm! People who love to eat but don’t have time to assemble complicated meals every night! It also demonstrates perfectly that vegan food doesn’t have to be fussy or bland. Heat a large skillet over medium heat. Once hot, add the grape seed oil, garlic, onion, and bell pepper. Season with a pinch each of salt and pepper. Cook for 3–4 minutes, stirring frequently until the onion is translucent and the bell peppers are lightly browned. Raise the heat to high and add the crumbled tofu. Cook for 5–6 minutes, stirring frequently, to begin browning. Then add the chili powder, cumin, and garlic powder. Stir to coat. Add the chipotle pepper, adobo sauce (optional), broth, and salsa. Stir to combine, then reduce the heat to low, cover, and simmer for at least 15 minutes. The longer it simmers, the more flavor the tofu will absorb. Stir occasionally. Prep any desired toppings at this time. Just before serving, preheat the oven to low broil and position the oven rack at the top of the oven. 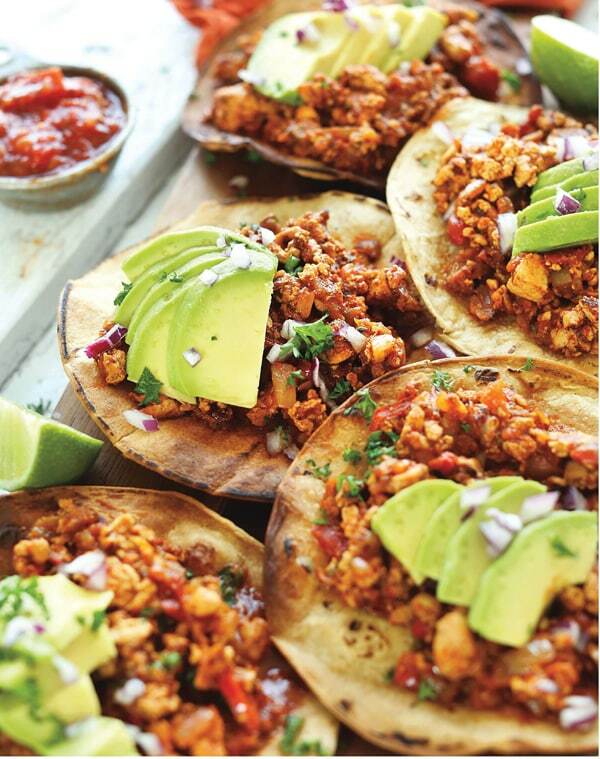 Brush the corn tortillas with the grape seed oil and arrange on 1 or 2 baking sheets, making sure they aren’t crowded. Broil for 2–3 minutes on each side, or until light brown and crispy. Watch closely so they do not burn. Set aside. To serve, top the tostadas with braised tofu and desired toppings. I love avocado, lime juice, hot sauce, cilantro, and red onion. Braised tofu will keep covered in the refrigerator for up to 5 days, though best when fresh. You can also enjoy the tofu in burritos, in tacos, or atop salads. These look amazing!! I’m always down for dinner with a Mexican twist – bonus points when it’s super easy. Dana is the queen of that! Can’t wait to get my hands on the book! Yum, mouthwatering! I just oredred my copy of the cookbook and can’t wait to leaf through the delicious and uncomplicated yet flavourful recipes. I love Minimalist Baker’s recipes, they always end up delicious! This is so delicious! My husband loved it! This was amazing! Loved by all! Can’t wait to try as a burrito/taco filling. The tostadas were a little harder to eat.